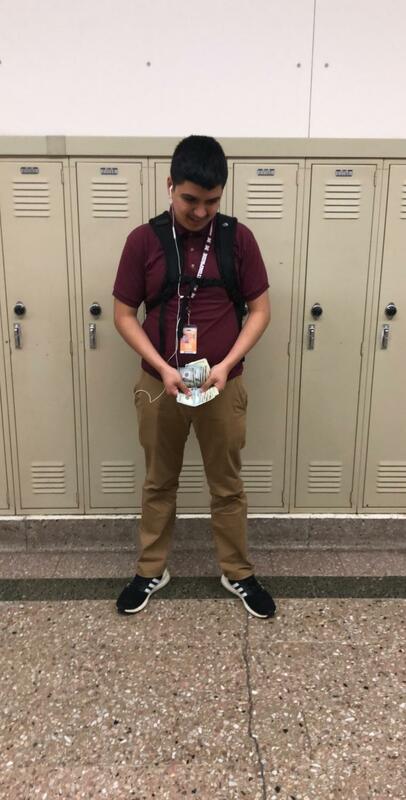 Many Morton East students believe that the boy should pay for everything when it comes to going out on a date on Valentine’s Day. Senior Raul Caro counts his cash. Will he have enough to treat his lady? According to CNBC approximately $143.56 is the cost of someone buying flowers, jewelry, candy, clothes and other gifts for Valentine’s Day. The person who is expected to pay the majority of the time is the male. Students state that finding someone who is willing to go half is a rare possibility. In a random survey of 120 Morton East students, 48 students expect the bill to go half and 74 students expect the male to pay. “The bill should not always depend on somebody but it should be fair. Valentine’s day should not be about your significant other, but also for those friendships that we all have,” Mr. Dugan said. Not all people think the same other believe the meaning of Valentine’s Day is more different. “My opinion is that the male should take care of all the bills on a date, it’s more of a nice gesture to do towards females in my part,” Christian Perez said. February 14th should not be all about relationships but also for the friendships that we have as explained by the students. “Valentines days shouldn’t just be for your bf/gf but for friends as well. As its day to commemorate and show the love& appreciation that you have for those of big importance in your life,” Alondra Trujillo said. In my opinion, I agree with what Alondra Trujillo said about Valentine’s Day Isn’t just about your Boyfriend or Girlfriend, but it could also be for friendships. Another thing that caught my attention was approximately cost for flowers, jewelry, and chocolate which reach to the 100’s, which is true because I can’t even buy my mom flowers because of how expensive they are. I agree that boys should pay for whatever they do with their girlfriends on valentines day as students from Morton East thinks so too. many people now think that do the fact how their parents raise them which is great. knowing how to be a respectful gentlemen. In my opinion men should not pay for the bill. 74 students believe that male should pay for the the bill but that is not right, it is better for both the couple collaborate with each other to pay for the things they ordered. Like Mr. Dugan said “The bill should not depend on somebody but it should be fair.” Even though some guys say that men should take care of the bill because it gives a nice gesture for the females, in some cases it is not true females feel upset that guy pays for the bill. Anyways Valentines days should not be just for couples but for friends like Alondra Trujillo said and i agree with her it is mostly about the love and appreciation between one another. p.s. Nice topic guys it was very interesting! The guy shouldn’t be the one paying everything for valentines day. I mean yeah it’s a nice gesture but there are other things you could do to show a person that you love them or care for them without spending a lot of money. I think that valentines day is kinda dumb because everyone just buys things for other people and show that they really care for that person just that one day when instead they should be showing that everyday. Many guys think that the more gifts you get her on valentines day the more she will love you. That is not true, any girl would be happy with just spending time with the guy.